For MidCOM 2.6 I decided to overhaul the system, and implement some new ideas. 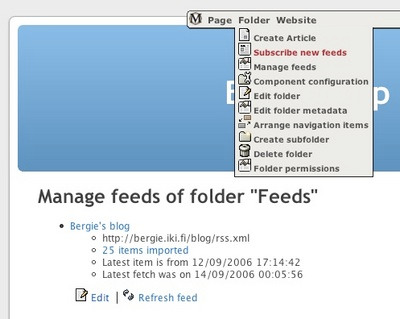 Now instead of being cached by Magpie RSS, the news items are stored locally into the Midgard database and displayed by the regular news-handling component. This gives flexibility in presentation and better performance. Feeds are now refreshed from hourly MidCOM cron, or manually. For Planet usage I’m also planning to add support for refreshing feeds based on weblog pings. To get started with the aggregator, install both net.nehmer.blog and net.nemein.rss, change the Enable creating news items from remote RSS and Atom feeds setting in net.nehmer.blog configuration screen and start subscribing to feeds.